The number one question that we get here at the Matcha Connection is; "What is the best matcha green tea powder"? So we decided to publish the most in depth guide to matcha green tea powder available today. I still remember the first time that I tried matcha. I like to call it my Matcha Moment. That is when I discovered the endless energy and mental clarity associated with matcha consumption. It wasn't until many years later that I discovered the numerous health benefits of matcha green tea. ​Where Does the Best Matcha Green Tea Powder Come From? What is Ceremonial Grade Matcha? Where to Store Matcha Green Tea Powder? How Much Does the Best Matcha Green Tea Powder Cost? Where is the Best Place to Buy Matcha Green Tea Powder? ​As you can see in the table above, the best matcha comes from Japan. ​Matcha green tea powder has quite a history that most people are unaware of. In fact, many individuals who are familiar with green tea, have yet to be enlightened to the facts surrounding the centuries old marvel of matcha. Dating all the way back to 7th century China, matcha was produced for use in tea ceremonies, and eventually was used in Japanese tea ceremonies during the 12th century. Present day matcha is still used in traditional ceremonies; however, it's uses have vastly expanded into other areas. For instance, a different grade of matcha, typically known as, "Food Grade Matcha", is used as a dye in various foods and confections. What makes matcha green tea powder special lies in the method in which it is cultivated. Weeks before green tea plants are set to harvest, growers cover the plants so that the remainder of the growth cycle takes place in the shade. By preventing the direct sunlight from reaching the tea leaves, the growth slows and an increase in the production of chlorophyll begins. This in turn gives the tea leaves a deep green color and increases the amount of amino acids found in the leaves. Only the youngest leaf buds are picked, then dried, and ground into a fine powder, retaining all of their nutrient goodness. The final result being matcha green tea powder. ​There are a couple of ways to make matcha green tea. The traditional way with a bowl and bamboo wisk. An innovative way with a milk frother. I thought that it would be better to show you how to make matcha green tea with a video. ​You can get a matcha set with bowl or a milk frother from Amazon. ​Currently, the best matcha green tea powder is mainly grown and produced in Japan. Specifically in the following Japanese areas, Uji, Nishio, Shizuoka, and Kyushu. Nishio and Uji are responsible for about 80% of the matcha grown in modern day Japan. The aforementioned areas are located in southern Japan, this region is said to have the best weather and soil conditions for growing the best quality matcha. Matcha is also produced in China and Taiwan; however, most matcha enthusiasts say the best matcha green tea powder originates in Japan. Matcha is typically graded according to where the leaves are located on the tea plant and by color. The grades of matcha are typically narrowed down to 2 distinct categories: ceremonial grade matcha green tea powder and food/culinary grade. As mentioned above, matcha was, and still is today, used in traditional tea ceremonies. These ceremonies require only the best quality matcha green tea powder available. Ceremonial grade matcha is made by grinding the youngest leaf buds on the green tea plant- the younger the leaves, the better the matcha. Ceremonial grade matcha is also grown with a strict and precise technique of shade growing. Using older green tea leaves equates to a lower grade matcha. The use of the youngest green tea leaves is one of the factors that gives matcha it's vibrant green color. Additionally, the shade growing process increases the chlorophyll content in the green tea plant, which is also responsible for creating the rich green tones in matcha. Food or culinary grade matcha is typically made from slightly older leaves on the green tea plant. This grade of matcha is used for drinking, as well as for dyes. The flavor, while slightly bitter, also has notes of sweetness, which has made it popular for confections, such as cookies, cakes, and other treats. It is even popular in matcha latte and cupcakes. It must be noted that food grade matcha is usually less expensive than ceremonial grade matcha; nonetheless, food grade matcha should still meet certain standards. For instance, it should still have a bright green color and fine, powdery texture. In addition to a somewhat pleasant taste. Certain people choose to drink culinary grade matcha simply because they prefer the taste and/or it suits their budget more so than ceremonial matcha green tea powder. With so much emphasis on organic products today, we thought that we should only buy organic matcha, but after speaking with some industry experts, here's what we found. ​The Japanese Agricultural Standard, or JAS, certifies organic foods in Japan. The JAS will only certify matcha to be organic if it was grown without the use of herbicides, pesticides, or manufactured fertilizer. Fortunately, there are natural ways to keep pests at bay, and natural fertilizer can be used, such as compost made with organic materials. These 2 differing cultivation methods can cause a differing taste in the end result. It is said that conventional matcha, or non organic matcha, has a more full bodied flavor, and that organic matcha has a lighter taste. Although, each matcha harvest can vary in flavor and body. The main deciding factor is a taste preference, as well as the preference to consume organically grown foods or beverages. The good news is that even if you cannot find organic matcha, or afford the extra cost that sometimes comes with it, you can count on the fact that matcha from Japan will contain far less pesticides than matcha grown in other areas. Japan has immensely strict agricultural policies, even more so than the United States. What this means is Japan has a very low limit of allowed pesticides and herbicides. In fact, the pesticide content difference between organic and non organic matcha, produced in Japan, is fairly minute. So you will have to decide for yourself if the extra cost associated with organic matcha is worth the expense. Personally, ​I like the peace of mind of knowing that I am not ingesting pesticides and I will continue to use organic matcha. You wouldn't believe the number of emails that I get regarding matcha caffeine content, so I thought I would address that subject here in the Ultimate Guide to the Best Matcha Green Tea Powder. The amount of caffeine in matcha green tea can vary, depending on where it was grown and produced. On average, a cup of matcha green tea contains around 70 milligrams of caffeine, while a cup of regular steeped green tea has about 31.8 milligrams of caffeine. A cup of matcha has about half the amount of caffeine in a cup of regular coffee, but that doesn't mean coffee is going to better provide that energy boost that most people are after. The caffeine content in matcha does contribute to the alert feeling one gets from drinking it; however, matcha (and regular green tea) have components, such as amino acids like L-theanine, that help regulate the body's absorption of caffeine. After drinking coffee, the average person usually feels very alert at first, but then comes the inevitable crash. This isn't the case with matcha because the caffeine is evenly absorbed by the body over a much longer period of time. One cup of matcha green tea can provide a calm feeling of alert energy for several hours, for some individuals, up to 7 hours. Coffee often makes people feel jittery and nervous, and then very tired and sluggish after it wears off, this is not the case with matcha, making it very appealing to those who want a boost of energy, without the jitters. Additionally, coffee has been known to cause high levels of adrenaline and glucose, as well as increasing insulin levels. We don't see these side effects with the caffeine in matcha green tea. Matcha should be stored in a cool, dark place. The important thing to remember is to keep your matcha away from light, heat and especially moisture. I have seen some websites recommend storing your matcha in the refrigerator, but I don't recommend this. Putting a metal container into a cold refrigerator can cause condensation and the last thing you want is moisture in your matcha. I also make sure that I consume my matcha green tea powder within one month of opening. I always use ceremonial grade matcha, which comes in small metal tins, so it is easy to consume it all within one month. The best matcha green tea powder is expensive, but I think you will find that it is well worth it. What is expensive? Amazon is the world's largest retailer. They are responsible for the products that they sell and they don't want to associate with products that don't live up to their claims. There are websites out there that are "sources" of matcha on the internet. They put their own label on the matcha packaging and you have no idea what you are actually getting​. You don't want to buy matcha from those "sources". Also, Amazon has thousands of verified reviews from people who have actually tried the different brands of matcha that they sell. It is as easy as picking a brand that has a lot of good reviews. For more information on the best place to buy matcha visit Where to Buy Matcha Green Tea Powder. ​There is only one way to find the best matcha green tea powder and that is to try each one of them. This was my favorite part! Below we will review each brand of matcha and rate them on several different criteria in order to determine the best brand of matcha green tea powder. We reviewed all of these brands of matcha at the same time so that we could make comparisons between them. Organic - All of the matcha green tea powder that we reviewed were certified organic. Ceremonial Grade - All of the matcha we reviewed is ceremonial grade. We opened a new package of each of the different brands of matcha. We then put the matcha on a white sheet of paper, so that we could compare the color. We then used the traditional method of preparing matcha tea, with a bamboo whisk, in a bowl and taste tested the matcha green teas all at the same time so that we could identify the differences. What is the Best Brand of Matcha Green Tea Powder? Each of these brands of matcha green tea powder were rated on a scale of 1 -5 for taste and color and grind. The grind should be extremely fine. Midori Spring uses only the finest young leaves from organic tea gardens in Aichi, Kyoto, and Kagoshima, Japan. We tested the Gold Class Ceremonial grade matcha which is certified organic by the USDA and the OCIA of Japan. The first thing that struck me about this matcha was the emerald green color. The second thing is the extremely fine grind. It is the mildest tasting of all of the matcha green tea that we reviewed. We rank Midori Spring in the top 3 for best brand of matcha green tea powder! Packaging - Small Metal tin with pop top and screw on lid. Tasting notes - This was the mildest tasting of all of the matcha green tea powder that we have tried.​ Definitely Recommended! 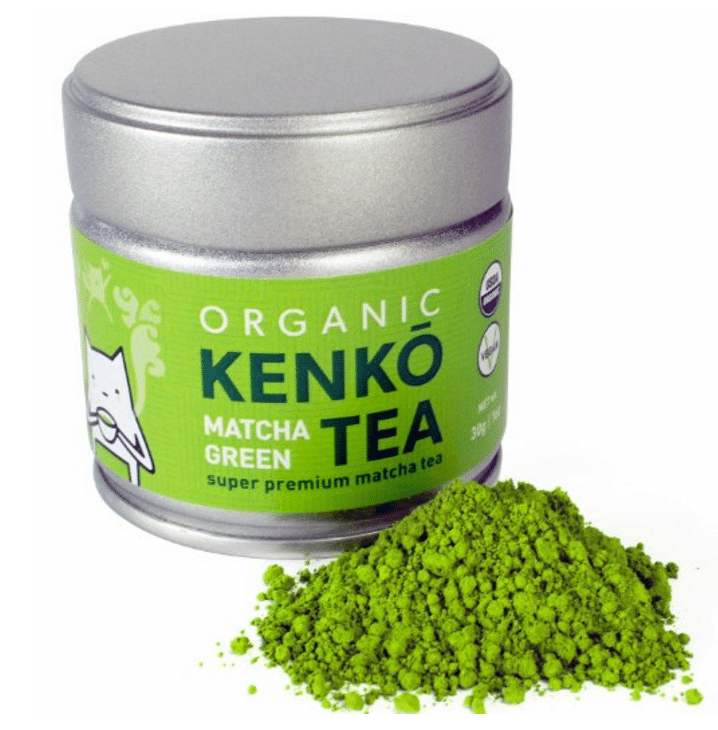 Kenko is an Australian company that works directly with matcha producers in Nishio Japan to import the best matcha green tea powder available in the world. We tested the Kenko ceremonial grade matcha that is certified organic by both the USDA and the OMIC. This is one of our favorite matchas here at the Matcha Connection and you can always find it here in our offices. Definitely one of the best brands of matcha green tea powder! Encha Matcha was founded by Dr. Li Gong and is focused on the process of bringing Japanese Organic Matcha from the farm to cup. This process has resulted in complete control over the matcha and possibly one of the best brands of matcha green tea powder that we have tried yet! Encha is grown in Uji Japan and is routinely tested for both heavy metals and radiation. It is quickly replacing some of the other matchas in our office as a favorite. This brand of matcha should definitely be on your list! Packaging - Encha is packaged differently than most other matchas. It arrives in a resealable bag and is BPA free. Tasting notes - Smooth and creamy, slightly sweet with no bitterness. One of our favorites! Kiss Me Organics ceremonial grade matcha green tea powder is 100% Japanese grown and certified organic. They use only the best quality, first harvest tea leaves for their ceremonial grade matcha in order to ensure the best flavor and color. I found this matcha green tea powder to be an emerald green color and the grind is ultra fine powder. The taste was grassy and slightly bold. This matcha is one of our choices for best brand of matcha green tea powder. Packaging - Small Metal tin with pop top and screw on lid with foil bag inside. Not sure about the reason for the foil bag. seems like overkill and not very environmentally friendly. Tasting notes - Somewhat grassy and bold. Very Good! Pure Matcha Organic Ceremonial Grade Matcha green tea powder is certified organic and grown only in the Nishio region of Japan. Nishio is known for growing the best matcha. Nishio’s stable climate, fresh pristine river waters, fertile soil, and remoteness from major urban development foster tea leaves that are more resiliently green and full of nutrients than those found in any other regions of Japan. Pure Matcha believes in focusing on quality and not quantity. All of their matcha green tea powder is picked at the peek of freshness and stored in cold storage until it is shipped. Pure Matcha Organic Ceremonial Matcha is quickly becoming one of our favorites. It's combination of vibrant color, fine grind and rich, creamy, slightly sweet flavor makes it one of our choices for best matcha green tea powder brand. Tasting notes - Rich and smooth with a hint of sweetness. Awesome creamy froth! ​Grace Ceremonial Grade Organic Matcha green tea powderis produced by the award winning Marukyu-Koyamaen, a well known tea production company in Uji, Kyoto, J​apan. The company prides itself on the freshness of its matcha green tea powder . All of its matcha has a best if used by date of seven months from grinding, which insures that you are drinking some of the freshest matcha available. While we like the flavor, texture and color of the Grace matcha, we do not like the fact that it does not come with a 100%satisfaction guarantee. We also don't like the fact that it is not available at Amazon. We prefer to purchase at Amazon because of the ease of returns and the validity that comes from unsolicited reviews. Tasting notes - ​Sweetly satisfying with a wholesome grassy flavor and a creamy froth! Uvernal organic ceremonial matcha green tea powder undergoes the most careful and meticulous growing, harvesting, and preparation procedures that have been passed down from generation to generation. This results in a premium tasting matcha that delivers all of the antioxidants and health benefits that you would expect from the best matcha green tea powder. This matcha is certified organic by the USDA. This was the best matcha green tea powder I found that was from china, but I probably would not buy this brand again because of the origin. Packaging - Metal can with pop top and plastic snap on lid. This was the least pleasing packaging of the top 4 brands. Tasting notes - I was very surprised by the taste of this matcha tea. It was very mild and given the dullish color and rather earthy smell, I was expecting a much stronger taste. MatchaDNA Ceremonial Matcha tea is grown in harmony with nature in the pristine mountains of Fujian province in China. It is organically grown on family owned farms and only the brightest young leaves are hand-picked and processed into MatchaDNA organic Ceremonial Matcha. This was our least favorite matcha green tea powder. It has terrible color as shown in the photo below. You can see the difference in color between the best matcha green tea powder and MatchaDNA green tea powder. Also, the fact that it is from China is strike two. Packaging - Metal can with pop top and plastic snap on lid. Not a fan of the plastic top. ​I hope that you have found our Ultimate Guide to the Best Matcha Green Tea Powder useful. It is packed with information and I hope that it answered all of your questions about this amazing superfood. The top 3 picks above in our matcha reviews​ are definitely the best brands of matcha available today and Amazon is the best place to buy matcha green tea powder. We will be adding more matcha reviews as we find more brands worth reviewing. We'd love to hear what you think! Please leave your comments, questions and suggestions on the best matcha green tea powder below. Click the button below to join the discussion! Add your questions, comments or suggestions for the best matcha green tea powder!